Meet the companies tackling nine of humanity's biggest problems -- and making millions saving us from ourselves. The background: Three billion households worldwide depend on wood and charcoal to prepare food, but a person cooking over an open fire that's burning wood or kerosene inhales the equivalent of the smoke from two packs of cigarettes a day. Respiratory infections are the leading cause of death in children under the age of 5 and kill 1.6 million people overall each year. The solution: Sun Ovens International, based in Elburn, Ill., sells a family-size solar oven for $259 that's used in 130 countries. A much larger solar cooker, including a trailer and a set of pots and pans, sells for $10,500 and is designed for schools, hospitals, and orphanages. 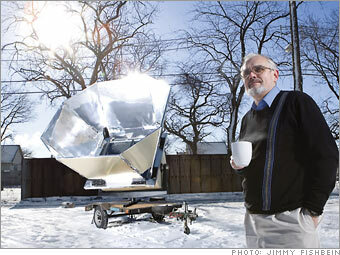 The solar oven uses mirrors to redirect the sun's rays into an insulated box. The ovens have been popular in Haiti; the United States and Canadian militaries will use them for humanitarian projects in Afghanistan, and they'll soon be available in Uganda and Nepal. The payoff: Sun Ovens has sold about 32,000 of its family-size ovens and 260 institutional units. Last year it generated $720,000 in revenue. The opportunity: Sun's CEO estimates there's a worldwide market for more than 300 million family-size solar ovens, which would generate at least $75 million in revenue annually. Blog: Can tech save the planet?